Healing Your Animal mists are individually hand-crafted from a combination of crystal, mineral, nature and flower essences. Healing Your Animal mists are created for both people and animals for finding better balance, pain relief, and inner peace. Personal customized mists can be made to order. Click here to schedule your complimentary meeting with Vicki to find the best Healing Your Animal services and products for supporting your animal’s optimal health and well-being. View our questionnaire for assistance selecting essences for you and your animals. The essences work great individually. I find they like to work in group of three(3)s to provide even more healing. The following are some packages (sets) of 3 that work well together. For more options, create your own set of 3 from the individual list of essences. Please contact us immediately about any product concerns. All sales are final. Animal Holiday - A great support set for animals for the holidays and year round. 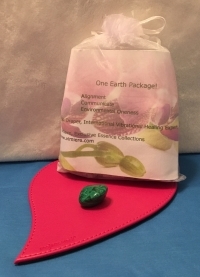 One Earth - Promotes harmonious connection with the Divine, yourself, Heaven and Earth and all beings. Physical Tune-Up - Working out the kinks to improve oneself.